I’m excited to introduce expert nutrition therapist Annabel Caulfield. In this guest post she offers practical advice to help you boost your energy levels throughout the working day. Wouldn’t it be fantastic to bounce out of bed in the morning full of energy, shine productively and creatively all day long, then enjoy an evening filled with satisfying and fulfilling activities? Is the reality more that you crawl out of bed after the alarm has gone off for the third time, practically inject caffeine intravenously to get yourself going, fight off the urge to snooze for most of the afternoon, then slump in front of the TV in the evening, because you’re too tired to do anything else? An extreme portrayal of low energy levels, yes. But if even a fraction of this second scenario applies to you, I would hazard a guess that you’re not alone! Many of us live our lives at full throttle, not taking as much care of ourselves as we could or should. One of the consequences of living like that is fluctuating energy levels. It could be that you wake up very early, but then can’t keep your eyes open after 9pm. Alternatively, getting up in the morning could feel like you’ve pulled an “all-nighter” for 3 nights in a row, yet by the evening you’ve found your mojo and can keep going for hours. But whether you’re a night owl or a morning lark, I’m betting you experience an early afternoon slump in energy. Most of us do. Skip back to the top. The first scenario may be idealistic, and in fact, unrealistic. We are all subject to circadian rhythms governed by light and dark. When it’s light the brain signals parts of the body that influence how alert we feel. When it’s dark it signals parts of the body which produce melatonin, the sleep hormone. But we are also all unique and those rhythms manifest differently, meaning people experience alertness and sleepiness differently. We really do seem to be split into those who ‘do’ mornings and those who don’t! Whether you’re a morning person or not, what you eat can greatly affect your energy levels throughout the day, and even how you sleep at night. Your body’s main source of fuel is glucose (sugar), but because blood levels need to be kept within tight parameters, your body has a mechanism to quickly move excess sugar out of the blood and into storage. Yes, that’s right, sugar ultimately gets turned to fat! Carbohydrates (bread, pasta, rice etc.,) but also fruit and vegetables are broken down into glucose. So if you eat a meal high in carbohydrates, your blood sugar will spike, particularly if those carbs are of the white variety. Your body’s homeostatic mechanism then kicks in, rather zealously if you’ve eaten something which converts to glucose quickly. The result may be that blood glucose drops lower than ideal. What follows could be an energy slump, foggy thinking, low mood and cravings for more carbohydrates. Just what you don’t want when you’re at work and need to be on the ball. Incidentally, caffeine can have a similar affect, so replacing food with a jug of coffee may not be the answer. Protein and fat! They take time to break down in the body, so combining them with a complex carbohydrate (think wholegrain, and of course vegetables!) slows down how quickly glucose is released in to the blood. With this steadier trickle ,the homeostatic mechanism for keeping blood sugar steady doesn’t need to come storming in to convert excess glucose into fat and get it out of the way. So, there is much less likelihood of levels dropping so low that your energy slumps and cravings kick in. So if you haven’t got time for breakfast, think carefully before grabbing a cake or chocolate bar on the go. You could be setting yourself up for a blood sugar roller coaster and energy crashes and cravings all day long. Not to mention a poor nights sleep. Try making time to have something with protein and fat in it. Your blood sugar will rise at a steadier rate, meaning there is far less opportunity for it to crash. With this steady rise and fall comes satiety and steadier energy levels. Breakfast isn’t necessary if you really don’t want anything to eat, but when you do feel hungry it’s imperative that you choose wisely, to stay energised for longer. Eggs are a great food because they are high in both protein and fat. Sugary cereals are not. And as a parting shot, think about this. 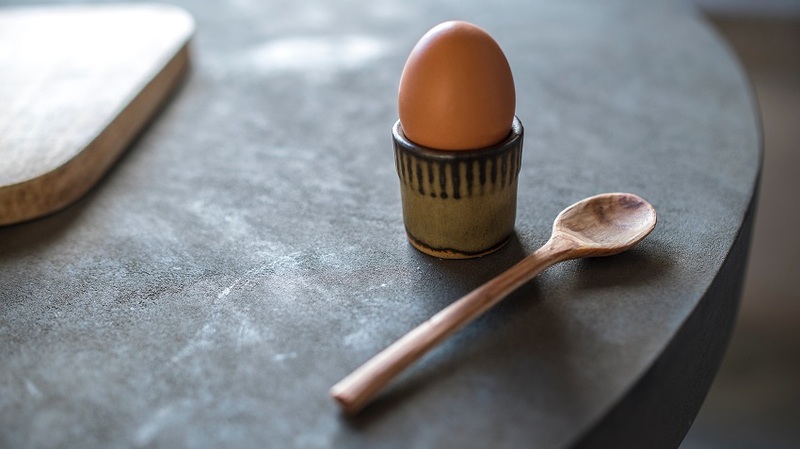 It takes 4 minutes to cook a runny boiled egg, and all the slow-releasing energy it brings. Still not got time? Annabel Caulfield of Purple Vitality is a Nutrition and Wellness therapist. She uses a naturopathic philosophy to assess root causes of ill health, and advises on dietary and lifestyle adjustments to help people reconnect with their vitality. Find out more here.